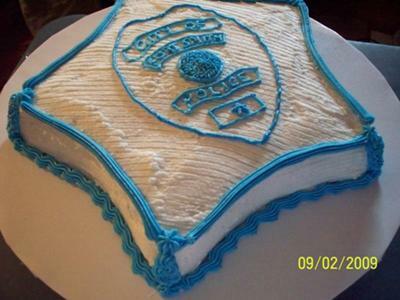 To make this police birthday cake, I used one cake mix and baked according to directions in a star shaped cake pan. Let cool completely. I received a picture of a badge and printed it. I tried doing the chocolate transfer but it didn't cooperate this time. So I just traced the outline of the badge onto the cake. And basically free-handed it. It wasn't great.